Soriah, which translates as “Milky Way” from Sufi, is the stage persona for the internationally recognized artist, Enrique Ugalde. Soriah’s craft is a blending of traditional Khöömei (Tuvan Throat Singing), tempered with Soriah’s own visceral force. Performances vary from being steeped in tradition and bound to its constructs to more experimental fascinations with electronic and acoustic accompaniments, and introducing Butoh and Ritual Performance Art. Soriah’s use of Khöömei as a transportive medium is an offering to nature in her own tongue, that of organic sound whether it be wind, water or the mimicry of animals. He is currently working to integrate his work into film and sound design. Soriah takes an annual sabbatical to Tuva to study with various masters and to compete. The 2008 Fifth Quinquennial Ethnomusicology Symposium, “Khöömei: The Cultural Phenomenon of Central Asia”, has honored Enrique Ugalde, “Third Place”, the highest a non-native to Tuva has yet placed. The Üstüü-Khüree Festival awarded him “Best Foreigner” for their 2008 selection. In 2014, he won 2nd place in the Tuvan National Kargyraa Competition. The rest of the year Soriah travels the globe with extended tours performing in various cities and enclaves of Japan, crooning in the cathedrals and ruins of Mexico, and intoning in ocean caves and amidst the swamplands of America. The artist has been invited to perform at society events such as The 2009 Peace Ball in Washington, D.C. for Obama’s inauguration, and by brigand artist elites, to sing at various installations of note at the Burning Man Festival. One becomes encased in an awe-laced ceremonial pallor while in attendance at a Soriah performance. A deep spiritualism imbues each piece performed, whether entirely traditional or exhibiting a fusion of music, movement and meditation that Soriah describes as Vocalized Ritual Drone. This video is an introduction to the three fundamental styles of Tuvan throat singing: Kargyraa, Khoomei, and Sygyt. Examples and demonstration of techniques are provided. Xorekteer (Throat singing from the chest) Generate a small bubbling sensation in your larynx by gently toning the phrase “Ahhh” and feel where the bubbling is strongest. This bubbling is created by your vocal cords/folds moving in your larynx. This is the region the throat that needs to be constricted. Now, sing the phrase “Ahhh” and squeeze the region of the throat (the larynx) that was creating the bubbling sound in the previous exercise. When you squeeze the larynx while simultaneously singing, it creates the xorekteer voice. Khoomei Generate the Xorekteer voice. Now, bring the lips and mouth into the shape of a small circular opening to create a chamber for the sound to resonate in. This proper reshaping of the mouth creates the Khoomei style. Sygyt While still practicing Khoomei, you can now bring the tongue to the top of the jaw, filtering the sound out through a small opening wherever you feel comfortable, creating the high whistle of Sygyt. Kargyraa Begin with the mouth closed for back pressure. Begin by clearing the throat with a squeeze of the larynx. Almost like making the tone “Hmmm”. When you feel the vibration of the throat coming on, open the mouth and experiment with different vowel sounds. *Photo of Kongar-ol Ondar by Bill Loewy courtesy Wikimedia Commons Email me at “jerry” at “didgeproject.com” for private lessons and questions. Just for fun! This is a simple overtone singing arrangement of the theme from Dvorak’s New World Symphony 2nd movement. The photos were all taken in the country outside of Prague. The creative act itself is dependent on the simultaneous occurrence of two seemingly opposite “realities” to create a new one that often brings with it a flash of insight, and sometimes humor. This third thing, this byproduct of opposing incompatibilities, is the spark of humorous insight. The creation equation. This video is another thing I’ve made to give me a chance to laugh at myself, and I hope it brings a little dual reality convergence into your mind and heart, and whatever goo lies between them. They ask me: “Does overtone singing have a healing effect?” Almost anything can be used to heal, and this is evinced by the promulgation of publications declaring the revitalizing potential of everything from asparagus juice to mashed up bee brains to the pheromones collected in the stringy belt of dad’s terrycloth bathrobe. My first hearing of overtone singing was followed by a period of intense desperation. My despair came with much enthusiasm, but I remember an aching desire to sing the way I heard on the recordings. I reasoned that if merely listening to overtone singing can excite profound fascination in me, than what can actually doing it make me feel? Pure ebullience was my guess. I sympathize with those who ask “how can I learn to do that?” I know they seek the same feeling I sought. What follows here is a rather incomplete list of suggestions, affirmations, and aphorisms which are in no particular order, but are most certainly not “random” to use the parlance of high-school times. “That was so random,” the young people say, and I do love them all for it. However those “so random” acts to which they refer are usually more deliberate and focused than anything else they have done all day–a foray of full intention, a precise and directed line against the backdrop of a quotidian wash. Randomness should not be confused with spontaneity, but either way–either one–I think we need a lot more of it. I hope the following list leads you closer to the kind of singing you want to do and the kind of feelings you want to have. Please know, however, that there are no magic words that can give you the skill. You have to play, experiment, observe, and adjust. 1) You can teach yourself. Though learning to overtone sing without a teacher might seem impossible, many adepts have acquired skills while sitting all alone in a room. I learned by listening to recordings of overtone singers from Tuva, Mongolia, Central Asia, North America, and Europe. Within a day or two of obsessive, continuous practice, I could imitate most styles with a reasonable degree of similarity to their sources. I have taught some individuals who catch the “knack”of a style within minutes, and it is very much a “knack” because there is an indescribable trick to turning on the sound, and when you get it, you’ll have it. I believe I got the hang of this with some ease because I’d played the trumpet and other brass instruments for many years before singing overtones. Other brass players have caught on quickly as well, and the “jaw harp”–specifically the tongue placement when playing–shares some very salient parallels with overtone singing. 2) Imitate other singers, but sing like you. All humans, regardless of age or gender, have the same digestive and respiratory components comprising the vocal apparatus. Each voice is unique and truly inimitable. You can waste a lot of time trying to sound like someone else, while your own intrinsic sound is there waiting for you to discover it. Muster the courage to work with your inherent sound because no one else in the world has what you have, and therein lies its value. 3) Listen as much as, if not more than, you sing. Maintaining enthusiasm is necessary to attaining skill and producing meaningful sound–“music” if you dare. But desire can keep you from your goal. In making efforts to produce high, ringing harmonics, the novice strains, pushes, pulls, and all around fails to observe the overtones that are already present in his or her natural singing voice. I recommend first listening for the harmonic overtones in your natural, uninhibited singing voice and, when identified, concentrating intensely upon them. By listening carefully, one learns that there is no need to force the emergence of what is already there. 4) Practice intoning vowel sounds while cupping the hand to the ear. Beginning on a pitch in your medium to low register (probably the frequency range at which you speak), intone around the vowel triangle, moving as slowly as you possibly can and breathing comfortably as needed. As you sing, cup your hand to your ear with the palm held slightly away from the jaw line. The cupping of the hand amplifies the higher harmonic overtones that characteristically fall away the moment your sound leaves your mouth and enters into the air in front of your face. I have observed this hand-to-the-ear technique at use in several of the world’s traditional singing traditions. Furthermore, in my opinion, the gesture of putting the hand to the ear helps to redirect awareness from the reactionary mouth to the responsive ear. 5) Practice the three “voices” and making transitions from one to the other. Almost any overtone-singing style is executed using one of three voices. The “voices” are more than just three differing vocal timbres. The first voice, the “neutral”or “natural”voice, uses no more laryngeal tension than is necessary for speech. Second, the “throat” voice (known as the khoomei voice in Tuva and neighboring regions in Central Asia), uses an immeasurable but clearly audible amount of increased tension in the larynx. Technically, the throat voice is made by increasing the length of the “closed phase” in each open-and-close cycle of a periodic frequency. The throat voice is not unique to Central Asia, and it can be heard in parts of Central and North Africa and among blues and rock vocalists such as Howlin’ Wolf and Captain Beefheart. Third, there is the “subtone” voice, which I think of as a kind of extension of the throat voice, but with prominent, and downright unmissable, sympathetic vibration of the false vocal folds and, in many singers, other surrounding tissues of the vocal tract. (For a more complete description of these voices and instructions for how to produce these voices, see my previous post). When you have learned to do the voices, work on moving smoothly from one voice to the next. Begin with your natural singing voice, on a comfortable, mid-to-low pitch, and increase tension until you move into the “throat voice, and then return to your natural voice. Also, move from the natural voice, to the throat voice, to the “subtone” voice, and then return again, breathing as needed. Remember the exercise is to attempt to make smooth transitions, but the result may be more of a turning on and off of these vocal sounds. 7) Sing outside. Explaining this one isn’t easy, nor is it really necessary. The natural environment is composed of powerful archetypal symbols that positively affect the human organism. The forms of nature–shapes, sounds, smells, textures, tastes–instill quietude and awareness that is conducive to overtone singing. I have a theory as to why, but I don’t want to write about it write now. You may find that the most pristine outdoor locations–edenic sanctuaries in your own backyard–inspire you to sing in this way. Moreover, many overtone-singing traditions have strong ties to the natural landscape and its myriad creatures. 8) When you sing a sound you like, don’t celebrate too soon; instead, take a moment to reflect on and remember the sensation of how it felt. Finally getting it can leave you so excited that you neglect to notice how it feels when you perform correctly (by correctly, I mean the way you want it to sound). Rather than going to show a friend, setting up the recording equipment, or running to your dad’s house to sonically heal his eczema, relax and observe your physical sensations and mental attitude that led to the successful performance. 9) Move through the overtone series as slowly as possible. Beginners often try to move up and down the overtone series too quickly, racing about and making articulatory movements too gross for stability. When you find three, two, or even one overtone(s) you can sustain with some clarity, stay there….enjoy that sound. Moving slowly is not only more difficult than moving quickly, but so too one can develop more control and usually derive more musical pleasure and meaning from singing within a limited range of the series; at least, at first. Aside from these nine simple suggestions, I can offer no more tips to mastery of overtone singing in all styles. It is impossible for, if not detrimental to, a student to receive a handful of universal, fix-all tips. A teacher must hear and see a student to make a proper assessment of a student’s ability and potential. There are too many variations on physiology and methods to help anyone without virtual or actual contact. Finally, to reiterate, skills can be discovered and perfected all alone in a room. You don’t need a cave, or a mountain top, an emaciated guru, or a trip to “exotic” locations to learn to overtone sing. Though I believe one can come to know the world from one spot on the floor in the house one was born in, there might be some truth to authenticating some styles by visiting specific locations on the planet. I just don’t know for certain. But do beware of authenticity, as most of the time, whenever authenticity arises in a discussion, there is a either a personal or cultural ego fighting for superiority over another. Oh, and money–authenticity debates and money seem to go together like rich kids and belted, khaki shorts. “Ours is better than yours”—what an asinine statement. If such debates arise around you, get away from those people and go to nature, an entity which has no need to justify its identify, and so it lives on and on. How does one learn to sing those seemingly super-low tones? Some people are as obsessed with low notes as they are with the high ones. For whatever reasons, the extremes of anything are attractive. Vocal infrasonics can be heard in various traditions: the yang chanting used ritually among some branches of Tibetan Buddhism; the folk music and throat-singing of Tuva (kargyraa) and Mongolia (kharkhiraa); the liturgical music of Sardinia (in the tenore bass voice): alongside the umngqokolo overtone singing of Xhosa women; and either occasionally or continuously in the epic songs of the Altai, Khakassia, and Sakha Republics. But the ability to produce subtones is inherent in the human vocal apparatus; consequently, this vocal technology also arises spontaneously and radically, which is to say, devoid of roots in any of the above-listed traditions. I used to tell people that to sing subtones they simply had to hit “second puberty”. Though the joke has since grown tiresome, there is truth to the onset of a lesser known secondary pubescence. At about the age of 26 years, the human brain typically ascends to another plateau of cortical development, whereby the pre-frontal cortex fully matures. Think back (or forward) to your twenty-sixth year or when-a-bouts. What was happening at that time? How did you feel? Anything change? Perhaps at twenty-six your voice didn’t start to sound like a chainsaw at the bottom of a well, but still, maybe we should rethink the concept of only one puberty, only one turning point in the ongoing development of the remarkably intelligent organism that is human body. Overtones exist. There is a clearly observable and measurable series of harmonic overtones that is inherent in periodic sound vibration. Overtones go over the main note, but is there a series of tones that go under the main note? Is there an undertone series? In formal acoustics, the undertone series remains a theoretical construct, not an actual acoustical phenomenon. To date, no one has produced evidence of an undertone series, a true mirror inversion of the overtone series that sounds simultaneously with the fundamental frequency (With singing, the fundamental is the actual note sung by the vocal folds). What is that low tone if it is not an undertone? I prefer to call it a vocal subtone, as it is caused by the oscillation of tissues that lie above the vocal folds. We use the vocal folds for everyday speech and song. The tissues above these actual focal folds are known as the false vocal folds, and you can see them on the diagram below, which is a cross sectional view of the larynx. When the actual vocal folds are set into periodic vibration with a highly tensed glottis, the false vocal folds are pushed together and slightly upward toward the back of the throat. I have imagined that when these slimy little flesh curtains are set into motion to produce a subtone, they look and feel like puckering lips. When set into motion, these false vocal folds vibrate most optimally, with maximum amplitude and consistency, at exactly one half the rate of vibration of the actual vocal folds. For example, if your actual vocal folds are singing an A 440 Hz and you set your false vocal folds into optimal vibration, you will produce a strong subtone of 220 Hz simultaneously with the 440 Hz tone of your actual vocal folds. Thus, you are producing two distinct oscillations spaced one perfect octave apart. For this reason, I prefer to use the term subtone instead of subharmonic or undertone to describe this phenomenon, as the secondary tone is not a partial harmonic of the actual note sung, but a distinct fundamental tone unto itself. Furthermore, being a tone unto itself and not just a partial, a subtone also has a corresponding overtone spectrum. Remember that overtones are parts dependent on the whole, which is the fundamental vibration. Overtones do not have overtones, nor should undertones have overtones. Does this remove the mystery from subtone singing? Not at all. We’re merely taking out the mystery and then putting it right back in again. No one knows exactly why the subtone vibrates so supremely at exactly one octave below the fundamental. Resonance might begin to explain it. The false vocal folds might absorb more energy when the actual vocal folds matches the resonant frequency of the false folds. However, one can sing a whole scale in subtones, which indicates the false vocal folds have an atypically wide range of resonant frequencies. Furthermore, the vibration of the subtone far exceeds the intensity of the vibration of the actual tone, and the false folds feel and sound as though they are not merely absorbing energy, but producing it independently. There you haven’t it: the mystery remains. Sing any tone naturally and slowly slide it up a little ways, and then go all the way down to the lowest note your can sing comfortably. Hold it. From that low note as your base, sing up about a perfect fifth (the opening interval of the Star Wars theme, the Superman theme, the E.T. theme, or the opening notes of just about anything by John Williams). Starting on that note about a fifth up from your lowest, begin to hum. For a few minutes, just practice holding that hum steady to get comfortable with your note. Pretend you are pushing an immovable object with all your strength and then grunt. Sustain the grunt as you sing your note. You should be feeling a lot of pressure building up beneath your throat, in your lungs, and all the way down to your lower belly. With that feeling of pressurization in your torso, imagine you are pushing up from the back of your throat where you feel normal vocalization while pushing down from somewhere a ways behind the base of your tongue. This is a difficult sensation to feel and remember, and most people feel more upward push from the back of the throat than they do downward push from the base of the tongue. There should be a sensation of the back and front meeting somewhere in the middle, where we find the false vocal folds. While pressurized and pushing the throat, begin to do the grunty hum and then add just a touch of cough and hack while continuing to sustain your note. Slowly and carefully adjust all the physiological parameters (degree of tension, placement of tension, pitch of your note, vowel, mouth open, mouth closed, seated or standing, morning voice or night voice, etc.) until the subtone appears. When it does appear, don’t chase it. Take a moment to stop and become aware of how it felt and sounded. Much of the learning here is in deeply internalizing a physiological memory of the sensation. When you achieve a consistent subtone, you will know it. The sound will be strong and it will seem to just lock into place on its own. Going too deep. When singing a subtone, you are not singing a low register note with the actual folds. The actual folds are actually singing a relatively mid-range note, and the false vocal folds are resonating at one half the rate of the actual folds. Similarly, beginning subtoners often associate the deepness of the subtone with deepness in their body. As a result they tend to put the sound too deeply in the throat to produce a gravelly rattling that feels like it is going into the chest—it’s kind of an old-man-with-his-orange-juice-in-the-morning sound. But the vibration of the subtone is actually above the vibration of normal vocalization. Send your awareness of the sensation upward, not downward. However, also keep awareness in the root of your body, at the base of your belly and even lower, from which the energy of this sound must come. I know it is confusing when you think about it, as there are lots of paradoxes in this kind of singing. Doing will make it clear. Vocal frying. One can produce uber low vocal tones by loosening the glottis to regulate the incoming puffs of air. These bubbly pops can be regulated to produce a false bass register, sometimes known as strohbass. In the morning, you can really get those low pops on or around the vowel “uh”, and you can make them go faster and faster until they resound a steady low tone. The vocal fry sounds primarily from the slack closure of the actual vocal folds. The sensation is completely different from subtone singing, which is an intense and simultaneous vibration of the tissues above the actual vocal folds. Over-Practicing. When I first started learning subtone singing, I did it for about 3 hours the first day, 6 hours the second, 8 hours the third, and none for the the 5 days that followed because my voice disappeared into infrasound. For a while I was speaking so low I could only speak in rhythm. The moral of the story is, you must proceed very carefully and patiently. Your false folds have lain dormant for most of your life, and now you’re asking them to wake up and vibrate. With gentle and moderate daily practice (no more than 7-10 minutes a day when first learning), the false vocal folds can begin vibrating freely and with no tickling or discomfort. The beginning subtoner, however, must endure some mild tickling and slight irritation when setting into motion the tissues of the false vocal folds. But with a little time, even the most intense sounding subtone vibrations will not and should not hurt if done properly. In this context, and perhaps many others, doing properly means simultaneously relaxing some areas of your body while tensing others. Finally, though at first you may have no idea how to do this kind of singing, you will have no doubt whatsoever when you have done it. The subtone will resound with such purity that you will just know that something mysterious still lies at the back of your throat. Because of the high number of nearly identical questions I have received about overtone singing, I have had to post a blog to save my finger tips, which as a result of my impeccable reply rate, now feel and actually look a bit like the surface of a stale Triscuit Cracker. I may never use a Blackberry again. But no loss. Moreover, people want to know more about overtone singing, and I’ve heard they are having a hard time finding answers. I promise this will be the most boring of my blog posts to come, for I must get the basics out of the way before I get to the good stuff, the juicy stuff, the stuff that you don’t even have to chew to swallow. But you must first learn what follows. A vocalist who sustains a steady tone while simultaneously isolating and amplifying distinct frequencies above it, uses a technique commonly known to the west as overtone singing. When manipulated to appear distinct, harmonic overtones of a sustained tone are usually perceived as ethereal, whistle-like pitches occurring above or within the sustained tone, and the overall, gestalt effect of overtone singing is of a singer producing more than one note at a time, usually a drone and melody that, for some, brings to mind the bagpipes. Still don’t get it? Don’t expect to completely understand how overtone singing actually works. I have been singing and studying overtones for ten years and still feel baffled when contemplating this vocal art. Overtone Singing leaves people fascinated in the aftermath of their initial shock of first hearing. And the mystery does not end; in fact, as one learns more, the mystery grows exponentially more profound. So be patient with yourself, and appreciate that the world still holds a little mystery. We live our lives inside an unending melody, and most of the time, we are oblivious to this music that is the ever-present harmonic series. I might just be able to prove this to you right now. Get comfortable in your seat, relax from head to toe, bring your awareness to the sounds around you, and do not judge the sounds as they enter in to the forever-open holes at the sides of your head. Now, you might be listening deeply; at least, deeper than before. Next, breathe in all the way to the floor of your belly, and sing–don’t just say–a steady “Ah” for the length of about one full breath. You might believe you have just sung a “note”, but in the real world–in the world of unending melody–you have actually sung several distinct notes. Congratulations on taking the first step out of audial oblivion. Sound is the result of air molecules energized into motion by vibrating matter. When something vibrates it absolutely must produce a series of tones above it; however, there are exceptions. But most of the time, these little tones are locked in to a pattern of fixed positions that are immovable. This lawfully organized pattern of tones appear in musical notation above, and it is called the Overtone Series, or the Harmonic Series. If you don’t read musical notation, you can still observe details in the patterns. For example, the tones go up the page and, the farther they ascend, the gaps between them become smaller and smaller. Other patterns can be observed. Do know, however, that the overtones do not end at number 16 as I have listed here. Actually, the harmonics continue to ascend way higher, and theoretically above the highest limits of the range of human hearing (max. 20, 000 Hz). I have listed the harmonics within this limited scope because the most overtone singing is performed within this range of the harmonic series. With all that said, I have yet to explain how it is done. The scientific explanation won’t help you learn to sing overtones, but put simply, overtone singing involves tweaking areas of resonance in the vocal tract and oral cavity. You tease your mouth and throat just enough until the overtones come out the way you want them to. It’s kind of like the hardware foreplay involved when putting a key into a reluctant lock. You know, whenever you have to cat sit for a friend, you always struggle a bit with the front door, but each time you put the key in the lock, you get a little bit better at getting in: For all things, we must endure a period of awkward acclimation. But you’ll get nowhere fast if you don’t listen hard. Well, not so hard you block yourself, but you must learn to augment your hearing sense. I learned to do overtone singing and Tuvan throat singing (see video demonstration below) by listening very carefully to the sound of my own voice. Sounds a bit narcissistic to sit in a little room for hours on end and listen to myself, but I wasn’t talking or saying words, and somehow that makes it more normal. Instead, I was sustaining steady long tones on different vowel sounds. Those were my words exactly when I first heard the tones inside my voice. I heard not just a bland drone that carries quotidian speech laden with signification, but a full chord of rich musical tones sounding out what seemed to be the music of the whole universe, and right there inside my little voice. I could hear nebulae exploding, black holes sucking dark matter, whole galaxies colliding, and an angry neighbor pounding on the wall with the handle end of a Swiffer. Hearing the harmonic overtones in my voice opened my ears and, consequently, opened my awareness. With my third ear open and my third eye in tears (what could have been taken merely as the sweat of my brow), I practiced listening and singing, seeking out recorded examples of overtone singing and imitating them, until I could somehow intuitively just do any overtone singing style I heard. I now believe, however, that I had a tool that worked in my favor. When I first began to sing overtones in winter 1999, I was also practicing self-hypnosis, and oh, what a tool it is. No, I didn’t dangle a pocket watch in front of my own eyes until I monotoned the words, “I hear and obey.” Instead, I practiced a method of inducing a state of relaxed awareness that summoned a deeper intelligence from within me. While in this state of relaxation, something akin to a meditative state, my subconscious mind rose to the fore, where it could more easily perceive and execute the singing of overtones. To sum up how I learned this, I merely listened carefully to myself and to recorded examples of overtone singing and relied on my subconscious mind to do the learning. However, I have since found ways of helping others find the harmonic series and sing with it. I have observed many students attain overtone singing skills within an hour or two. Learning to be musical with overtone singing techniques, however, might take a little longer, for just how long does it take to become musical? Seems to me that it is always there, lying dormant, until we are ready to risk heightened sensitivity. Meanwhile, as one begins to hear overtones in one’s own voice, the sonic world begins to change. One starts to hear music in what was previously thought to be the most unmusical of places. I remember hearing a jumpy vacillation between the 6th and 7th partials of the harmonic series in the spiraling water of a toilet bowl. I remember trancing out to the beautiful and endless shimmering ring of the 11th partial above the droning hydro transformer in the grocery store parking lot. I remember hearing folky pentatonic melodies– jigs, almost–when my housemate underwent his nightly oral hygiene ritual using his Philips Sonicare electric toothbrush. I also remember hearing the music of sound in more organic and less gross settings. I heard it in the winter wind singing through the tops of tall Balsam Firs; I heard it in the humble trickle of a dying stream at the center of a forest of cedars; and even in the breathing of a newborn human infant and the joyful weeping of its host. Thus, the unending song of the harmonics is all around us, and if we give ourselves over to listening, the harmonics sing themselves. Before one can sing overtones, one must first practice hearing them. To service the world’s rising demand for skilled overtone singers, I offer lessons via Skype. Tuvan throat-singing, or Khoomei, is the area with which I have the most extensive experience. While I am familiar with other types of harmonic singing and chant, the main focus of this page will be Tuvan. You can find some information/links about other regions below. There is no real consensus on Khoomei categories; this is a complicated issue due to a number of confusing factors. For one thing, affecting western scholars, there have to date been very few texts about Khoomei in Western European languages. The most commonly cited source when I began my research in the early 1990s was translated from Tuvan Folk Music, a book published in 1964 by A. N. Aksenov, a Russian composer who surveyed Tuvan Khoomei styles in the 1940-50s. More recently, there have been such resources such as Mark van Tongeren’s quite interesting Overtone Singing, various CD liners of varying quality and accuracies, and WWW sites such as my own Khoomei.com, which also vary greatly in worth. As noted below, #4 and 5, Borbangnadyr and Ezengileer are sometimes considered to be proper styles, and sometimes to be ornamentations added to Khoomei, Kargyraa, or Sygyt. I would add to the top of the list Xorekteer, as it underlies most of the various styles. All video examples are QuickTime movies. Click here to get QuickTime (available for Mac and PC). All movies are © Steve Sklar/Skysong Productions, Inc. and may NOT be copied or distributed without consent. All Rights Reserved. Please Note: If you don’t have QT Pro and want to save the videos, then either R click (PCs) or Option Click (Mac) and do a Save to Disk, then view the .mov file from your hard drive. If you have QT Pro, then you can view the videos from within your browser, and save them from there. If you view them from within your web browser, I recommend configuring the browser to view them using the QT plugin, as this lets you begin viewing as the files download. Xorekteer means singing with the chest voice… Now, this can be confusing to beginners: What does “chest voice” mean? And why isn’t it the “throat voice?” This term can carry several meanings. It can be used, like khoomei, to mean ALL THROAT-SINGING, in any style. It can also be used as a metaphor for “with feeling,” as in “more heart.” Plus, it can refer both to the feeling of pressure one feels when throat-singing, and also to chest resonance, which is obvious in person but not on recordings. In its common sonic sense, “Chest voice” has a totally different meaning than the western vocal context, and the two should not be confused. Those familiar with Tuvan music have noticed that often entire songs are sung with this voice. It usually serves as the springboard to launch into khoomei style and sygyt. Here is an excellent example in MP3 format, the song, Kombu* This solo by Kaigal-ool of Huun-Huur-Tu (accompanying himself on doshpuluur) demonstrates perfectly the characteristic sound of the Xorekteer voice, with its hard, bright tone, and he uses it as a launching pad to sing khoomei, sygyt, and kargyraa. Khoomei is not only the generic name given to all throat-singing styles, but also to a particular style of singing. Khoomei is a soft-sounding style, with clear but diffused-sounding harmonics above a fundamental usually within the low-mid to midrange of the singer’s voice. In Khoomei style, there are 2 or more notes clearly audible. Compared to Xovu Kargyraa or sygyt (see below), the stomach remains fairly relaxed, and there is less laryngeal tension than harder-sounding Sygyt. The tongue remains seated quietly between the lower teeth. The pitch of the melodic harmonic is selected by moving the root of the tongue and the attached epiglottis as in my “Yuh!” technique (see Lesson 1). On the upper illustration below, the epiglottis is seen as the light-colored projection rising from the root of the tongue. It is to the right of the hypopharynx, also referred to as the laryngopharynx. Kargyraa is usually performed low in the singer’s range. There are two major styles of Kargyraa, Mountain (dag) and Steppe (xovu). Both feature an intense croaking tone, very rich in harmonics. This technique is related technically to Tibetan harmonic chanting. NOTHING feels like Kargyraa; you really feel a “mouthful of sound.” The term refers to all styles of singing which simultaneously use both the vocal and ventricular folds inside the larynx, as dual sound-sources. See the lower illustration below, The Larynx. When the larynx is constricted slightly just above the level of the vocal folds while the vocal folds are engaged, the ventricular folds will usually resonate, producing the second sound source. The ventricular folds’ fundamental vibrates at half the speed of the vocal folds, producing the extra sound one octave lower than the usual voice. The ventricular folds also produce many midrange and upper harmonics. While not yet proved, I suspect that each set of folds produces its own harmonic series, which intereact and are affected by the formants of the vocal system. Careful listeners will note the “constant” sound produced by the vocal folds, and a periodical, pulsating complex of sounds created by the ventricular folds. Kargyraa often sounds more traditional, or authentic, when the vocal folds are in Xorekteer mode, as above, and when the sound is somewhat restrained, rather than freely exiting the mouth. Kargyraa is the one Tuvan style that I know of that is closely linked to vowel sounds; in addition to various throat manipulations, the mouth varies from a nearly closed “O” shape to nearly wide open. Except for the throat technique, this style is vaguely related to western overtone singing styles that use vowels and mouth shapes to affect the harmonic content. However, unlike most western styles, there is no dependable correlation between the vowel and the pitch. Generally, western overtone singers link pitch to the vowel, so that “ooo” gives the lowest harmonic, and rise in pitch from “ooo” to “o” to “ah” to “a” to “ee,” and so on. In Kargyraa, an “ah” can be higher than “a”, etc. For sygyt, you must increase the tension a bit at the same place as in khoomei. The tongue rises and seals tightly all around the gums, just behind the teeth. A small hole is left on one side or the other, back behind the molars, then you direct the sound between the teeth (which produces sharpening effect) and the cheek towards the front of the mouth. With your lips, form a “bell” as in a clarinet or oboe, but not centered; rather off just a bit to the side of your mouth where you direct the sound from that hole in the back. You change pitch with the same technique as khoomei, as in my ‘Yuh!” technique (see Lesson 1), and the rest of the tongue moves slightly to accommodate this action. The raised tongue serves as a filter to remove more of the lower harmonics, and in sygyt, it is possible to nearly remove the fundamental. Chilandyk is a mixture of Kargyraa and Sygyt. One usually begins with the Kargyraa voice, and then uses Sygyt technique to add a harmonic melody. If one can sing both Kargyraa and Sygyt then Chilandyk is not too difficult; what is challenging is maintaining the base pitch in tune while singing the Sygyt melody. Whew! Chilandyk is named for the Tuvan word meaning “cricket,” and there is a definite cricket-like quality when sung in a high Kargyraa voice. 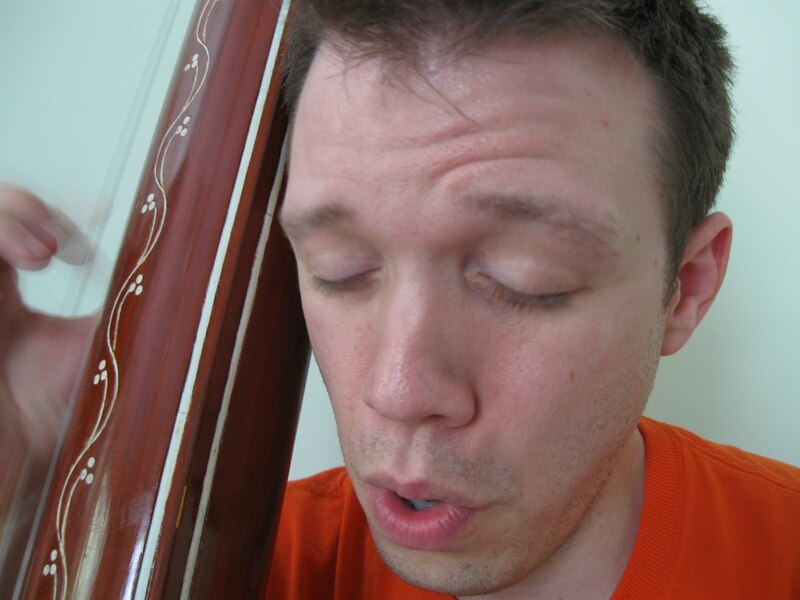 Nasal singing is common among western overtone singers. 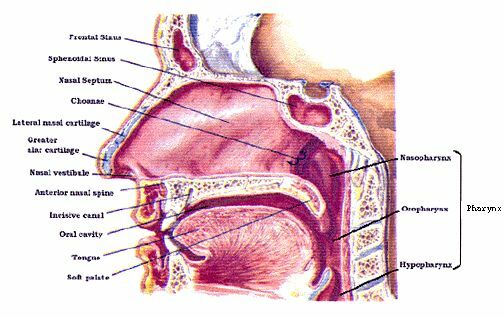 It is commonly believed that the directing sound through the nasal sinuses enhances the high harmonics. However, my observations indicate that the increased high harmonic components are not the major melodic frequencies in styles such as sygyt and khoomei, and also that open nasal passages provide a passage for some lower frequencies that might be better filtered out. To control the amount of nasal sound in your voice you must gain control of the velum, as in ezengileer, above. You can feel the velum open when you sing and then close your mouth. The sound will then exit the nose, via the velum and sinuses. To feel the velum closing, sing a sustained note with your mouth closed. Try to stop the sound without moving your tongue (keep it down in the back of the mouth and don’t jam it back into the upper throat to stop the sound. And don’t pinch-off your nose! If you can stop the sound, you will have isolated the velum. When closing it while sounding, you may feel it push up by the airflow. Once you’ve isolated the velum, work on developing its use. Practice opening and closing it rhythmically, even practicing, say, triplets or dotted eighth notes. Also, experiment with opening it in degrees, not just opened-and-closed. On the first illustration below, the velum, unmarked, is located between the nasopharynx and oropharynx, just to the right of the soft palate. The low multiphonic chordal of the Tibetan monk’s chanting style is related to kargyraa, with a low fundamental often in the 80 Hz range. The sound is produced by the combination of the vocal and ventricular folds. The larynx is typically held low in the throat, conducive to low tone due partially due to extendind the air column. The lips are extended and nearly closed, also lengthening the air column and serving as a filter to remove the upper overtones. Other fine details vary among individuals, as well as, to a degree, different monastic traditions. The monks most widely known for their multiphonic chanting, known by various names such as Yang, Dzho-Kay, and others, are the Gyume and Gyuto. I have heard others, too, such as the Drepung Loseling monks and others. Khakassia: Just northwest from Tuva, the art is called Khai (or Xai). There are 2 videos of Khai singers at the khoomei.com video page. Altai This republic directly west of Tuva is home to Kai singing. Here’s an MP3 by the group, AltKai. Bashkortostan In this southern Ural Mountain republic, the regional throat-singing is called Uzlyau. I have a recording of uzlyau performer Robert Zigritdinov, which I’ll eventually digitize. He does appear on van Tongeren’s book/CD. The performers sometimes simultaneously play flute and sing, as in Mongolia. This is an unusual tradition, as several researchers mention that performers often don’t know any other performers, or teachers. The means of transmission is therefore quite vague. Inuit “throat-singing” is a very different vocal art than the others included here, and is not multiphonic. However, it does sometimes use similar vocal timbres which often include the use of both the vocal and ventricular folds (I believe). And, as in the case of the Tibetan monks, it is not true “singing.” It sometimes involve the unsual technique of vocalizing on alternating inhalation/exhalations. Here is an article with an interview with Inuit throat-singer Evie Mark, and a video sample of Evie and Sarah Beaulne. I’m not sure if this tradition extends to other areas of the Arctic. From Widipedia: The Ainu of Japan had throat singing, called rekkukara, until 1976 when the last practitioner died. It resembled more the Inuit variety than the Mongolian. If this technique of singing emerged only once and then in the Old World, the move from Siberia to northern Canada must have been over Bering Strait land bridge some 12,000 years ago. Inuit Throat Singing: When the men are away on a hunting trip, the women left at home entertain themselves with games, which may involve throat singing. Two women face each other usually in a standing position. One singer leads by setting a short rhythmic pattern, which she repeats leaving brief silent intervals between each repetition. The other singer fills in the gap with another rhythmic pattern. Usually thecompetition lasts up to three minutes until one of the singers starts to laugh or is left breathless. At one time the lips of the two women almost touched, so that one singer used the mouth cavity of the other as a resonator, but this isn’t so common today. Often the singing is accompanied by a shuffling in rhythm from one foot to the other. The sounds may be actual words or nonsense syllables or created during exhalation. This video identifies some parts of the interior larynx. Ever wonder how videos of the inside of the larynx are made? See this video about fibroscopy, used to make endoscopic videos. • Go easy! When learning you’ll be using your anatomy in new ways. Don’t sing too loud, too long, or too often; use common sense! 1. Take a good mouthful of water. 2. Extend the lips to a point. I’ll try do produce a video demonstrating this hydrating technique. Stay tuned! • Musical Tip: Remember that any technique or action that changes any sonic parameter, including pitch, tone, texture, etc., can be manipulated in time to produce rhthyms. • If you are having trouble getting the basic kargyraa voice, try singing it with your mouth shut. The velum will open, allowing you to sing through your nose. The smaller outlet produces back-pressure, which helps many folks to get the sound. • To strengthen the kargyraa sound, and to make it easier to “get fresh” each time, practice alternating the sound like flipping a switch: With the vocal folds engaged producing a sustained tone, repeatedly engage and release the ventricular folds. • Make sure that your mouth is open at least enough that you can hear what you’re doing in your throat! Also, too much constriction in the larynx or elsewhere will kill the sound. Just enough for a good sound, and no more! • As in many endeavors, the tendency is to OVERDO. To use too much tension, airflow, volume, intensity. More often than not, the answer is to back off. Use only as much effort as necessary, only where it is needed. Too much pressure can also damage your vascular system; there are many stories of Mongolian singers who used too much pressure and broke blood vessels. Don’t blow a gasket!!! • Avoid hurting your throat. There is a simple equation at work here: Pressure (airflow, powered beneath the diaphragm) meets constriction in the larynx. Too much airflow meeting this constriction will stress the throat. Try this: Close your mouth, and blow hard. Your cheeks will puff out and eventually your lips will give out. Imagine doing this with more delicate, sensitive membranes as in your throat. Don’t do this! Links – Voice, vocal anatomy, etc. Structures of the larynx Good site from Mythos Anatomy/Webmed, with interactive anatomy figures. The Singing Voice: Anatomy More good info on the vocal anatomy. Lots of useful graphics, videos, and links. Don’t miss the section on Castrati, and remember that it may improve sygyt but at the expense of a good, deep kargyraa. Act accordingly. A Basic Overview of Voice Production by Ronald C. Scherer, Ph.D. Lots off good definitions of vocal terms. 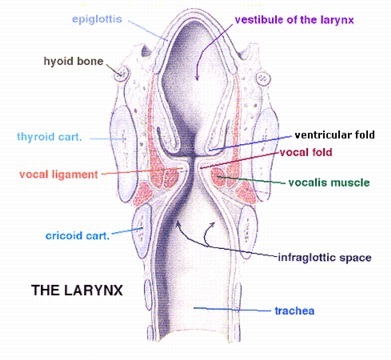 How the Larynx (Voice Box) Works Charles R. Larson, Ph.D. Good article with good graphics. Google Search: “singing” and “larynx” Can’t get enough, now, can you?